A majority of Americans are ready to protest. Here's what's got them fired up. The political gravity has shifted towards the left in NBC News/WSJ poll — and towards gun control. WASHINGTON — The numbers are in: Americans are fired up. More than half of Americans — 57 percent — say they are outraged enough about an issue that they would carry a protest sign for a day, according to a recent NBC News/Wall Street Journal poll on social trends. That’s comparable to shares in 2014 and 2015 who said the same, but the survey also finds that the political gravity has shifted in the interim towards the left — and the issue of guns and gun control. In 2014, 61 percent of Democrats said they felt passionate enough to carry a protest sign, while 60 percent of independents and 54 percent of Republicans said the same. Now, the share among independents has fallen to just 43 percent, while Republicans have ticked down to 50 percent. But among Democrats, nearly seven-in-ten — 69 percent — now say they are upset enough about an issue to protest it. 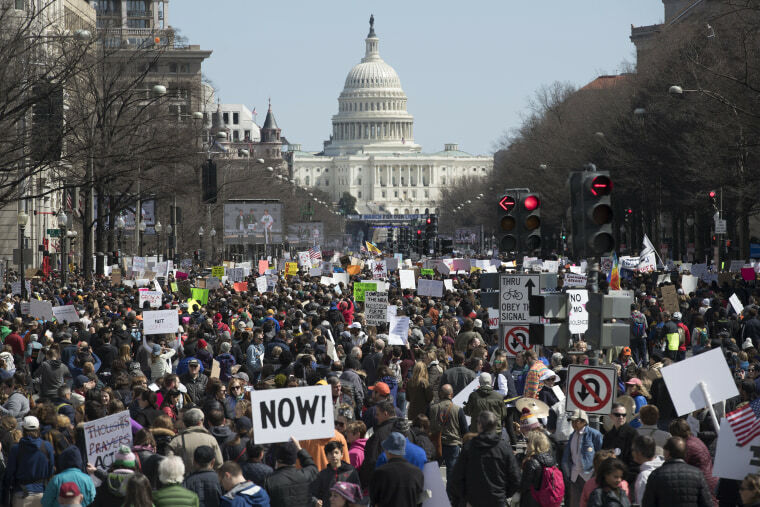 What Americans are protesting about has changed significantly too, perhaps most vividly illustrated by last weekend’s nationwide demonstration of support for victims of the Parkland school shooting. Guns are now the dominant topic named by both Republicans and Democrats when asked what they would use a protest sign to convey. That’s a change from 2014 and 2015, when abortion and immigration dominated among respondents on the right, while those on the left cited a hodgepodge of issues including health care, funding Planned Parenthood, the Black Lives Matter movement and getting money out of politics. The NBC/WSJ “social trends” poll was conducted March 10-14, about a month after the Parkland shooting but before the gun control-focused March for Our Lives. While guns remain a dominant — but divisive — issue, the poll’s respondents also cited the pushes for both gender and racial equality as the most important political movements in America overall. Twenty-eight percent of Americans (including 15 percent of Republicans, 27 percent of independents and 41 percent of Democrats) named the fight against sexual harassment and gender inequality in the workplace as the most important movement. Similar shares (27 percent overall — including 10 percent of Republicans, 24 percent of independents and 44 percent of Democrats) cited the movement for greater racial equality. Almost half of Republicans said that “protecting our borders and limiting immigration” is the most important political cause in America today, while about four-in-ten Democrats pointed to efforts to address climate change. The poll found that 55 percent of Americans believe that abortion should be legal in all or most cases, while 43 percent disagree, saying it should be illegal in all of most cases. That’s a record high level of support since the poll began asking the question in 2003; the previous high was in January 2013, when 54 percent supported all or most abortion as legal, while 44 percent disagreed. Support for legal abortion in all or most cases outweighs opposition in most subgroups, but opposition to abortion in all or most cases is the dominant position among Republicans, Trump voters, rural Americans, and seniors. As the country faces continued demographic and political change, the majority of Americans — 54 percent — say that they are comfortable with the country’s increasing diversity and tolerance for different lifestyles, gender roles, and other experiences. That includes 53 percent of independents and 74 percent of Democrats, but just 29 percent of Republicans. The 25 percent of Americans overall who say they are uneasy with these changes include a plurality of Trump voters — 44 percent — while 23 percent say they are comfortable and an additional 29 percent say they fall into neither category. Millennials are particularly comfortable in this new cultural environment. Almost two-thirds of those aged 18 to 36 — 64 percent — say they embrace increasing diversity and tolerance, while just 16 percent say they are uncomfortable with it. Among those who are Baby Boomers and older, 49 percent say they are comfortable while 31 percent are uneasy. Some of that gap may be reflected in the different ways that the two generations experience the world. Fully 85 percent of millennials, but a lower 67 percent of Boomers (aged 58-75) , say they have a friend who is gay, bisexual or transgender. And while the same share of millennials — 85 percent — say they use social media every day, just about half of Boomers say the same. The live-caller NBC/WSJ poll was conducted March 10-14 of 1,100 adults – nearly half reached by cell phone – and it has an overall margin of error of plus-minus 3.0 percentage points.